They're not Family - they're more like Associates! This brand new expansion to Nothing Personal adds some familiar faces to your game as Classic Gangsters join in the fun. The Russian Mob are also getting involved, along with a new group of Female Gangsters - and they're all heading to the two all-new Casinos! Will luck be on your side? 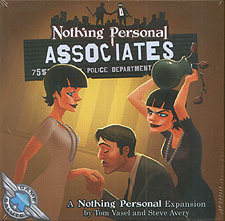 Discover for yourself in Nothing Personal: Associates!